So the badass is about to finish off the Big Bad or a daredevil is about to accomplish an impossibly cool stunt. What's the best way to really establish these feats? Why, you simply have a twinkle appear in the character's eye to signify that he's about to accomplish an awesome feat. Related to Twinkle Smile, which is the same thing but appears on the character's teeth. Like the Twinkle Smile, often comes with an Audible Gleam. Can also be used on Cool Shades. Contrast Glowing Eyes of Doom. Not to be confused with Tinkle in the Eye or Twinkle In The Sky. Happens in the episode "Stairway to Devon" when Officer Jenny spots Team Rocket. Dawn in the episode "Battling a Cute Drama!" Pokémon Ranger and the Temple of the Sea. While Jack Walker (the title Pokemon Ranger) is apparently trapped aboard the Phantom's submarine, he has one of these just before his daring escape. 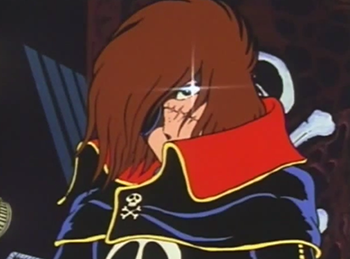 Captain Harlock (pictured above) does this all the time in the original 1978 series, and other characters do this to a lesser extent. Often done in Tengen Toppa Gurren Lagann with Kamina and later Simon's shades. The title character of Vuk the Little Fox has a twinkle in both of his eyes when he spots his prey. Justified as he's a fox whose eyes glow in the dark. At the beginning of Doc Savage The Man of Bronze, Doc drives up to his Fortress of Solitude on a snowmobile, after which we see a twinkle in his eye. The Great Race. When Maggie DuBois first meets The Great Leslie he flashes a couple of these. A running gag in The Muppets movies is Miss Piggy's eyes shining the first time she sees Kermit, whether it's their actual first meeting within the story (The Muppet Movie, The Great Muppet Caper), an It's a Wonderful Plot erasing their previous relationship (It's a Very Merry Muppet Christmas Movie) or just been a very long time (The Muppets). In The Muppets' Wizard of Oz, it's Kermit/Scarecrow's eyes that shine when he meets Piggy/Glinda. The Flash (2014). Barry's eyes always give off an electric flash whenever he's about to do something awesome, crazy, reckless, or all at once. In this case it's justified, since it's a visible effect of the charge-up of his Speed Force powers. The Monkees. In several episodes including the first, Davy gets a pair of eye twinkles whenever he lays eyes on the Girl of the Week, and often as not she twinkles when she sees him too. Wonder Woman. In the first season opening the title character had these in each eye. Tales from the Floating Vagabond. The Time Police are mighty agents of Truth and Justice who always have a sparkle in their eyes, a gleam in their smile and a spring in their step. In Undertale, Undyne's eye twinkles just before the boss fight with her, assuming the player has not killed Papyrus. Undyne starts giving a speech about everyone's hopes and dreams relying on her before the eye twinkle, but then says "SCREW IT!" and throws her helmet off. Her left eye, previously covered by an Eyepatch of Power, also twinkles constantly as "Undyne the Undying" in a No Mercy playthrough. It actually becomes a game mechanic in the fight against Asgore. One of his attacks has his eyes repeatedly flash before he launches a series of screen-filling strikes. The only way to avoid them is to predict what kind of attack he'll use is by seeing what color his eyes flash. In Marvel vs. Capcom 3, when Haggar is doing his Rapid Fire Fist hyper move, you can mash the attack buttons to make him punch faster; his eyes will glint to show that it works. His eyes will also glint in his Level 3, Final Haggar Buster. The Wonderful 101 does twinkles all the time, most notably, Wonder Pink when doing on of her acrobatic stunts during the game, has a twinkle in her eye emphasizing how awesome is was and blinks at the audience that goes "aw". Metal Gear Rising: Revengeance: main character's eye shines all the time. And some of the enemies gets twinkles just about they're about to attack. Bayonetta. In-game, Bayonetta's eye shines when she switches weapons. Eye twinkles are also all over the place in cutscenes, until it culminates in a self-parody scene where even a cat doll gets twinkle ◊. Shounen Kininden Tsumuji: Tsumuji's rival Hayate does this before starting his duel with Tsumuji. This is used in the trailer for Super Smash Bros. 4, where the Villager has one in his introduction. It's also used on every character when they're selected on the fighter select screen. During a match, this same eye twinkle happens on their image at the bottom by the damage percentages if they fully charge a special move, once they obtain a Smash Ball, and once they perform a Final Smash. In Hero Oh Hero, Burk does this when he (thinks) he's managed to get himself an acid spewing pig as a mount (by throwing it off a cliff). This happens to Mr. Bogus in the second act of the episode "Class Clown Bogus" while awaiting a slice of pizza that got catapulted into the air. To wit, a twinkle appears in both of his eyes. A twinkle appears in Wade's eye when he claims that he's going to fly in the U.S. Acres episode "Shy Fly Guy". However, it's subverted afterwards when Wade quickly chickens out at the last minute and starts clucking like a chicken. Twilight Sparkle does this in "Elements of Harmony" when the other ponies come to her aid. Twilight does it again in "Magical Mystery Cure" when she found out how to fix Star Swirl the Bearded's spell. In The Crumpets episode "Pong! The Menace! ", when Caprice does a internet search on the pink diamond with a worm inside, a twinkle occurs to the worm's eye in the web image/video after its definition was narrated.